In more than seven years of war in Syria, we have seen many times how Western governments and news media shamelessly invert reality. The same was seen this week over the grim fighting around Eastern Ghouta, the suburb near the capital, Damascus, where 400,000 people are said to be trapped. But who is trapping who? US and European media breathlessly claim that Eastern Ghouta is under siege from Syrian “regime forces” allied with Russia. This description is posing things upside down. The district was taken over nearly six years ago by foreign-backed extremists, like Jaysh al Islam, Ahrar al Sham, and Al Nusra Front. The latter is an internationally outlawed terror group, but they all share the same murderous ideology, as well as the same Western covert sponsors in the American CIA, British MI6, French DGSE, and lavish Gulf Arab funding. It is these illegally armed insurgents who are holding the civilian population under siege in a reign of terror. The same situation, and Western inversion of reality, has been seen before, most notably regarding Syria’s second city of Aleppo. The Syrian and Russian forces liberated that city at the end of 2016, and since then life for the residents there has fortunately returned to the normal peaceful, pluralist coexistence which prevailed before the foreign-backed terror goons took over. Yet, Western media and officials continually fabulate about “rebels” and civilians being besieged by Syrian state forces. This inversion of reality is of course necessary in order to push the Western false narrative that has underpinned the covert Western war for regime change in Syria, including the clandestine support for terror groups as proxies. Further twisting the situation in Eastern Ghouta this week, the Western media blamed the Syrian “regime” and Russia for not implementing a ceasefire plan to enable evacuation of civilians. Russia proposed a daily five-hour truce, and the Syrian government established humanitarian corridors exiting from the conflict zone. The proposal from Moscow was a reasonable counter to what the US, Britain and France had wanted, which involved a 30-day cessation of all military operations. The Western powers had tried the same proposal during the liberation of Aleppo. Syria and its legally mandated Russian ally are within their sovereign right to take back remaining territory that has been illegally occupied by foreign-backed militants. What the Western powers would like to impose is a No-Fly Zone over parts of Syria to enable their residual proxies time and space to regroup. Why should the Syrian government forfeit its sovereign rights by accommodating foreign enemies? The reason why the Russian humanitarian relief plan proposed this week for Eastern Ghouta did not gain traction was simply because the militants continually shelled the designated corridors for escaping civilians. Video footage clearly showed buses and aid workers organized by the Syrian government waiting to receive the civilians. But none were permitted from the area because of sniper and mortar fire from the militants. Evidently, the militants are holding the civilian population as hostages and human shields. The same criminal tactics were deployed in Aleppo and other towns and cities where the terrorist gangs ruled with their death-cult barbarity. Russian Foreign Minister Sergei Lavrov, addressing the UN Human Rights Council in Geneva this week, rightly pointed out that the humanitarian relief plan for Eastern Ghouta can only be made to work if the militants commit to upholding a ceasefire. But these foreign-backed mercenaries have done nothing of the sort. They have not only cut off evacuation corridors under fire; they continue to launch rockets and mortars at nearby government-controlled Damascus inflicting dozens of civilian deaths in recent weeks. 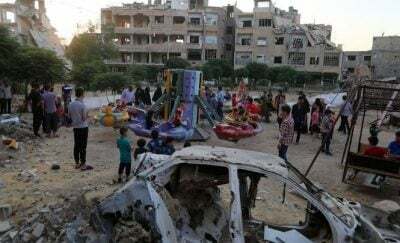 Reliable figures cited by the Syrian Free Press network, indicate that some 85 per cent of the Syrian population live in areas under the control of President Bashar Assad’s state forces. Only a small minority – 15 per cent – live in areas controlled by insurgents. And many of those people are being held in these dwindling areas against their will in a state of fear imposed by the so-called jihadists. The brazen Western media propaganda war – misnamed as “news” – reports totally from the minority areas, which are exalted as “rebel bastions”. In all the so-called “reporting” by France 24, BBC, CNN, and others, the information is either sourced from the CIA-sponsored and terrorist-affiliated White Helmets media operation; or anonymous “residents” and “activists”; or it is sourced from “a UK-based monitor” who is an exiled Syrian furniture salesman who has not been in Syria for 15 years. This pathetic Western mainstream media “journalism” has been going on for the past seven years in relation to Syria. Significantly, when do you ever hear a Syrian government official or diplomat being aired directly and at length in these media? Or Russian officials? Never. It’s all a one-way street of lies and fabrication. The preposterous inversion of reality that the Western governments and media have perpetrated over Syria can only be sustained through systematic distortion. Russia’s humanitarian relief plan for Eastern Ghouta has so far been sabotaged by terror groups firing on civilians. But Western officials and media have the brass neck to claim that the long-suffering population is under siege from the very forces who are trying to liberate them from terror. When Eastern Ghouta is eventually liberated one thing is sure. The Western media will never follow-up to ask residents what their lives were really like. Just as these same vile propaganda outlets did not follow-up on liberated Aleppo. As if the distortion couldn’t get any worse, this week the New York Times and other Western media reported claims that North Korea had secretly supplied materials for chemical weapons to Syria. The reported claims seemed unconvincing, as usual, and the Syrian government denied the latest allegations. Alongside that the British government asserted this week that it would order air strikes on the Syrian “regime” if it found proof that chemical weapons were used. Adding up the Western distortion it is obvious what the objective is: to find a pretext for overt military aggression on Syria. The covert proxy war using terrorist mercenaries has failed. Now the Western terror sponsors need to take the distortion to an even more demonic level. In truth, there is indeed a siege in Syria. The entire Syrian nation is under siege – by criminal Western regimes and their equally criminal propaganda media, justifying war and aggression. Featured image is from Theirworld.